In the mid-90s (March 1995 to be exact), I was in my local big-box book store and I saw Oprah on the cover of Runner’s World. It said, “Oprah can do it, so can you!” I bought the magazine – for the first time ever – and learned about her marathon training program. Because of this article, I started running for fun. I entered 5Ks and 10Ks and even ran a leg of the White Rock Marathon with my employer’s team. I never ran to win the race but I enjoyed the camaraderie of the sport. I also found that the more I ran, the more I enjoyed the longer distances. Eventually (a few years later), I decided that if Oprah can do it, I could, too. I really wanted to complete a marathon! To me, the marathon seemed to be a goal that a lot of people had but they didn’t really try for it or they didn’t stick to a training program so it was an unattainable goal for them. I wanted to reach that goal and earn a finisher’s medal. So I’d made the decision that I wanted to complete 26.2 miles. TWENTY-SIX POINT TWO MILES. BY FOOT. No car, no bike. All 26.2 miles under my own power in a pair of sneakers. What now? How do I DO this, I thought? I did a little research and I signed up for former Olympian Jeff Galloway’s training program. The people in this program were an eclectic group of folks who came from varied backgrounds – there was a podiatrist (who became quite the expert that we all called on), elite runners, retired grandparents, and working moms and dads like me. Jeff’s program is a run/walk program and I had my own individual program all outlined for me to work on during the week and then we all got together for the long slow distance runs on the weekends. I lived in Texas at the time and no matter what time of year it was, it was bloody hot to run. Either that, or it poured down rain. There really was no “nice” weather. But I loved the idea of working towards my goal of completing a marathon. After signing up for the 6-month program, I was grouped with the grandmas who’d never run a marathon. I was a new mom but I was o.k. 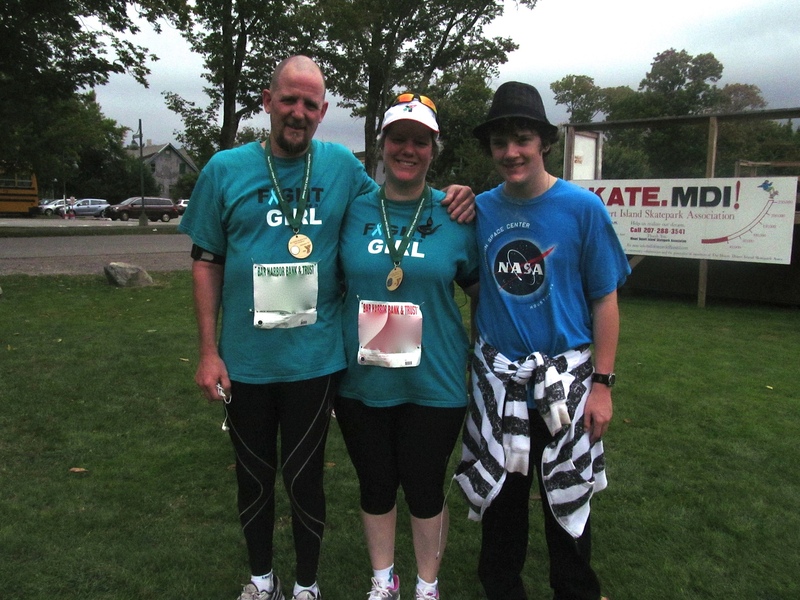 with being with the grammies since I didn’t have a time goal – my only goal was to finish. I learned quickly that I would need to be self-motivated and disciplined to work the program that was laid out for me. Honestly, it looked easy on paper and in the grand scheme of things, it was easy as long as I followed it. My favorite part was the long slow distance runs. I learned a lot about the lives of these strong women. Some were old-fashioned and had never worked. One these ladies wouldn’t make a single decision (I’m not even sure she knew that might even be an option) – she deferred everything to her husband who was also training but he was in a ‘faster’ group. Another one was a widow and had raised her kids on her own. And another lady – 75 years young – was training for a half marathon rather than the full marathon. These ladies all inspired me and I looked forward to our weekly runs because since the long slow distance runs were at a slower pace, we could carry on conversations. This training took place in what was the height of the ‘Furby’ craze so I got to hear about how each grandma was going to have THE favorite gift for the Christmas season (apparently the black-and-white ones were the prized ones to have way-back-when). As a new mom, I would never ever consider such a gift for my kiddo but I learned all sorts of tidbits about patience and choosing my battles during my journey through parenthood from this ladies. What I found with the training was that there would be easier days like the tempo runs and tougher days like hill training. OK, let’s be real….where I lived in Texas, there were not many hills but we managed. If I was careful and didn’t overtrain, I could stay on target and not get injured. Jeff’s program suited me perfectly because his philosophy with the long slow distances is to keep pushing ‘the wall’ back – each week, gradually increase the distance. And each week I did. Each week I was able to go farther and farther and my self-confidence grew with each passing week. We all entered the White Rock Half Marathon for a training run (we were scheduled to do 16 miles that day so we started with a 1 1/2 mile warm-up and continued after the half for another 1 1/2 miles). Jeff came to a few of our training runs and critiqued our running styles, made corrections as necessary, and offered an immense amount of knowledge and support to us. I remember after our 24-mile run, he was snacking on a Snickers bar. Before anyone could criticize him, he said with a sincere smile on his face, “As far as I’m concerned, if you complete 24 miles, you can eat anything you want.” As a Snickers fan, I heartily grabbed one, too, because as far as I was concerned, I couldn’t believe I’d just done 24 miles and there was no doubt in my mind that I would finish my marathon now. What a mental high that was for me and such a boost to my self-confidence. I was an athlete who was about to enter and complete a marathon. That’s right….I, with the silhouette of a penguin, was finally an athlete. The more I thought about it, the more I figured she was right. Marathons are much more mental than physical. The fight to beat cancer is very mental – if chemo gets a hold of a negative thought, it will run away with it and that can be a dark hole that is hard to be pulled out of. So I went into marathon-training-mental-mode and made it through chemo relatively unscathed. In March, I was told I was in remission. I was thrilled. When I went into remission, I signed myself up for a half marathon. I signed up for the very one that I had to pull out of last year a week before the race due to being diagnosed with cancer. I wanted that finisher’s medal that I was unable to get last year. The chemo has lasting effects and it’s taken me quite a while to develop any sort of physical stamina. I am getting stronger each day and I’m proud of myself with each new accomplishment. A year ago yesterday, I was on an operating table having tumor debulking surgery and was staged with late-stage ovarian cancer. Yesterday, exactly one year later, I was lined up at the start line for the Bar Harbor Half Marathon (my favorite race of all – I’ve done it many times) in my Fight Like A Girl shirt, the shirt I wore to every single chemo treatment. Just like my battle with cancer, this was a family event. My sweetie also entered the half marathon and my son entered the 5K. I started the race early with the walkers (the runners started an hour later) and met up with a beautiful 85-year old woman who said she was “as slow as molasses” and I told her, “I doubt that. You’re looking strong to me.” I got passed during mile 5 by the first runner who wore nothing but his Under Armor compression shorts and sneakers. His number was pinned to his hip because there was not another stitch of clothing on him. A few minutes later, another gentleman and the first woman zoomed past me. Runners continued to catch up and pass me for the next few miles but I didn’t care. I was doing my own race. This wasn’t a competition for me. This was a day of celebration in how far I’ve come in the last year. On the dreaded mile-long climb in the middle of the race (I still haven’t gotten over my phobia of hills), some friends of mine who were running the race came from behind and said hello and asked how I was doing. I said I was doing great – and I was – and they continued on. Every volunteer shouted, “I LOVE YOUR SHIRT!” and I got applause from volunteers and runners who passed me and said, “Keep going!” My sweetie, who started with the runners, caught up and I heard him holler from behind me. We crossed the 9-mile marker together and then he zoomed ahead of me to finish his race. At mile 11, a lady at the top of the hill said, “If this was easy, everyone would be doing it. You look fantastic! Are you having a good half marathon?” I said, “I’m having the best half marathon. It’s sure beats where I was last year and I will finish no matter what.” She gave me a thumbs-up and then I was joined by a wonderful lady who asked if she could walk with me part of the way. Since I was the slow one, I had been by myself much of the race so I said she was most welcome to walk with me. I learned that she lived in the area and she is a 22-year breast cancer survivor. We chatted for almost a mile and she hugged me before jumping off the course. I only had a little over a mile left and then I’d be at the finish line. I was also joined by the ‘bike sweep’ who is a volunteer who stays with the last person in the race to ensure everyone is off the course so that the mile markers and water stops can be packed up and the wonderful volunteers can go home. He would have also radioed for transportation if I wanted to abandon but I didn’t. I told him my story and I learned about his 72-lb weight loss over the last year and his journey to fitness. I was starving and he was so generous – he zoomed over to the golf course on his bike and bought me snacks and water to get me through the last mile. I didn’t catch his name but I will never forget him. My sweetie had already finished the race and came back to finish with me while my kiddo, who had completed his 5K earlier in the morning, took photos. I walked every step of the half marathon since I’m still not up to running. Just like my battle with cancer, I never once thought about abandoning or quitting. Once again, I met incredibly generous people along this course who offered me tons of support just like people who have helped me through my battle with cancer. Much like life itself, I saw everyone that passed by me has his or her own style of running. Whatever that style is, it works for them. They were smiling and they each finished the race. I waddled like a penguin across that finish line and I got my medal. I am still an athlete. I covered the same distance as everyone else and I did it with my own style. I don’t care how long it took. My goal has never been about time. My goal has always been to finish. Thank you, Jeff Galloway. Your training program has served me well over the years not only in completing marathons, but it has also helped me face my toughest battle yet. I finished that battle and intend to keep it that way. Whatever your goal is, don’t let anyone or anything stand in your way. If I can do it, so can you.